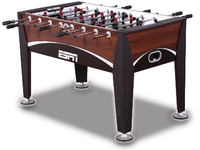 Though the Melbourne table has a sleek looking design, it falls short of many of the qualities we look for when analyzing a table for performance. 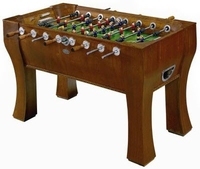 We like some of the features on the Melbourne like the adjustable leg levelers and the side ball return, but the rod handles and the quality of the foosball men are definitely lacking on this table. 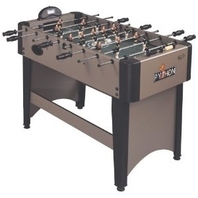 The Melbourne doesn't allow for the ability to pin the ball down to the table to learn shots like the snake shot because they have a thicker and more round toe than some higher quality tables like the Tornado or Dynamo brand tables. 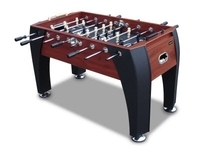 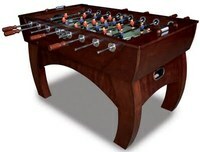 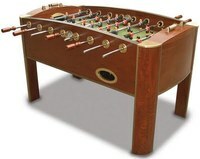 This foosball table is priced around $300 US.